An instant rebate of $100 off the original sale price has been applied! Price shown reflects price after rebate. Offer valid only through April 30! 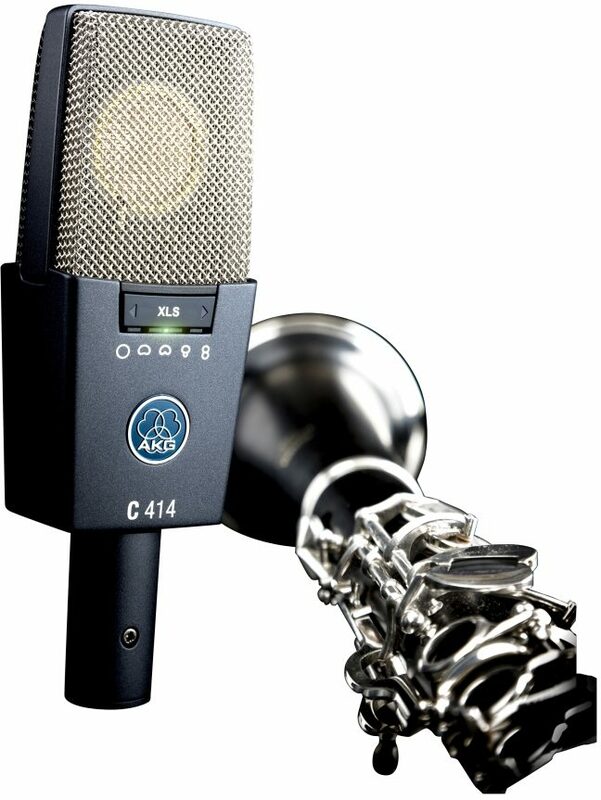 A recording studio staple since the 1970s, the AKG C 414 microphone hardly needs an introduction. This instantly-recognizable large-diaphragm condenser has seen a handful of revisions over the years, as AKG has responded to engineers' demands for ever-greater headroom, sensitivity, and linearity. As an update to the B-ULS, the longest-lived C 414 design, the C 414 XLS is AKG's most neutral-sounding 414 model. The cutting-edge XLS is intended for accurate and detailed sonic reproduction, but it also retains the classic C 414 signature of extended low frequencies, crisp top end, and a gentle low-mids dip that rounds off the harsh edges of voices or instruments. Holding up its predecessors' reputation as a go-to mic for piano, drum overheads, classical ensembles, vocals and much more, the C 414 XLS adds unmatched versatility with an impressive nine pickup patterns. A multi-pattern microphone allows you to dial in a particular sound right at its source. If you're going for a natural character, choose a wider pattern; for a more direct, "in-your-face" quality, lean toward the hypercardioid pattern. The XLS' rocking switch rotates through omni, wide cardioid, cardioid, hypercardioid, bidirectional figure-8, and four intermediate settings for a total of nine patterns, for more flexibility than typical 3-to-5-pattern mics. With the C 414 XLS, you can always go a little narrower to add a heightened sense of reality or eliminate bleed from surrounding sources when recording an ensemble. Plus, the plethora of pickup patterns on the C 414 XLS makes it possible to place multiple mics in X-Y stereo, middle/side setups, ORTF pairs, Blumlein pairs, or even a Decca Tree configuration. When you connect your C 414 XLS to phantom power, you'll see LEDs illuminate in green as you select your pickup pattern. If phantom power is interrupted, the C 414 XLS keeps its last pickup pattern in memory, so your mic will power on to the exact setting you left it -- which is especially useful if you have your XLS mics hanging in hard-to-reach spots over a choir or a large drum kit. Once you've made your pickup pattern selection, lock it in by holding the switch for three seconds to prevent bumping during handling. The LED lights provide quick visual confirmation for your settings. And with an eye toward visual confirmation, this update to the classic C 414 design has a distinctive silver grill on the front and a black grill on the back, so you can tell which way your 414 is facing from across the studio. With its legendary stature as one of the most universal, versatile large-diaphragm condensers of the past four decades, the C 414 adds formidable flexibility with nine pickup patterns in the C 414 XLS model. If you don't already own one or more of these classic microphones, now is the time to round out your collection with AKG's updated version of the legendary C 414. AKG's legendary C414 needs no introduction - it is a tool found in most recording studios and has been used on thousands of hit records; it's been on stage with artists of every musical genre and is also used by leading broadcast facilities the world over. For over 60 years, leading musicians and engineers have used legendary AKG microphones to capture their sound so their audience hears every nuance. The C414 family has been one of the world's most widely-used and respected studio and stage microphones in audio history. 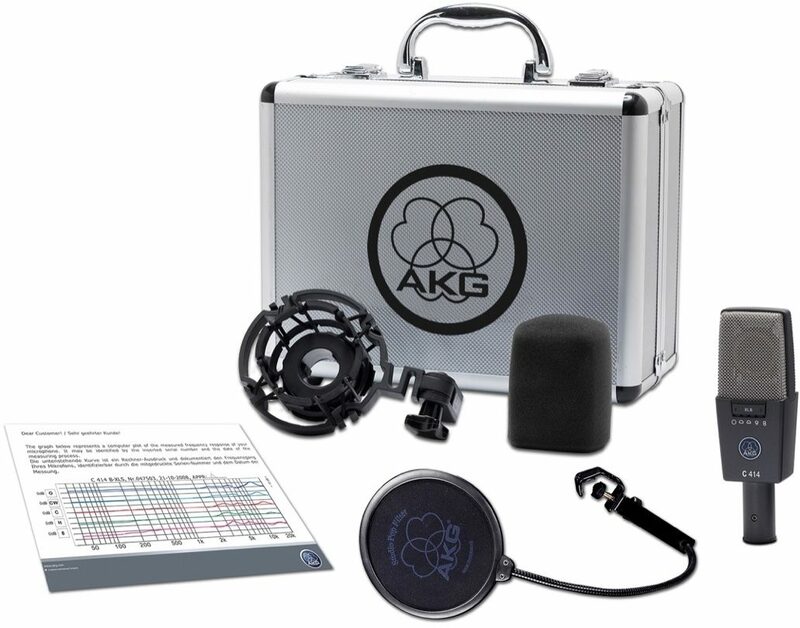 AKG has continually set benchmarks for useful features, improved technical specifications and ease of use to answer requests from ever-demanding recording studios, broadcast stations and audio engineers. The models C414 XLS and C414 XL II offer nine pickup patterns which enable to choose the perfect setting for every application. For live-sound applications and permanent installations all controls can be disabled easily for trouble-free use. A Peak Hold LED displays even shortest overload peaks. The C414 XLS maintains the sonic character of the legendary C414 B-ULS, the longest-lived C414 model. Engineered for highest linearity and neutral sound, it is the most universal and versatile large-diaphragm microphone for decades. Widely used for accurate, beautifully detailed pickup of any acoustic instrument the C414 XLS combines proven reference quality, leading-edge technology and state-of-the-art components. The C414 comes complete with carrying case, pop filter, windscreen, and spider-type shock mount. If you've spent any time at all in a serious recording studio, you've no doubt seen a few AKG C 414 large-diaphragm condenser microphones in action. Their signature sound reproduction and flexible operation have been a standard in the recording industry for many years, and their rock-solid durability keeps them going session after session. AKG has released some updated versions of the legendary C 414, including this XLS model. Its one-inch diaphragm and selectable roll-off and pad settings maintain the same level of sonic integrity as the original C 414, with the added benefit of nine selectable polar patterns to increase the versatility. The front panel of this microphone displays symbols for five common pickup patterns, including Omnidirectional, Wide Cardioid, Cardioid, Hypercardioid, and Figure Eight. The XLS selector switch lets you toggle between these patterns, plus four intermediate steps to deliver all nine options. A green LED indicates which pattern is selected. This LED serves double duty, turning red to indicate input overload. The switching happens electronically, and uses some of the required phantom power to function. The C 414 XLS remembers the last setting when phantom power is removed, and you can use the Lock function to prevent accidental switching while tracking. The wide (20 Hz - 20 kHz) frequency response of the C 414 XLS is fairly flat, with some unique sculpting that happens depending on which polar pattern you're using. The Hypercardioid setting, for example, adds about 2 dB in the 3 kHz range, plus a little added presence at around 15 kHz. Engaging the Omni pattern scoops 2 dB out at 1.4 kHz but bumps the 6.5 kHz zone up about the same amount and creates a sharp little 5 dB peak up around 13 kHz. This combination of polar response and subtle frequency shading really expands the tonal palette. But it doesn't stop there. The rear panel gives you access to a selectable low-cut filter, offering a roll-off at 40 Hz, 80 Hz, or 160 Hz to tighten up a ton of different instrument and vocal sources. The 40- and 80-Hz settings are fairly steep, with 12 dB per octave filtering. The slope on the 160 Hz setting is more gradual, rolling off 6 dB per octave. The rear panel also houses the selectable pad. Attenuation of -6 dB, -12 dB, and -18 dB is possible, with a maximum SPL of 158 dB. The C 414 has a respectable 140 dB SPL rating with the pad off, as well. The 134 dB dynamic range is capable of reproducing a good amount of nuance in vocal and instrument performance. AKG provides a healthy assortment of accessories to help you realize your C 414's full potential. You get an aluminum travel case for safe transport and a plastic shock mount to reduce handling noise and unwanted vibrations. A foam windscreen and adjustable pop filter are also included. Setup was very straightforward. The shock mount was easy to couple to a basic boom stand, and the C 414 XLS seemed stable and secure in the mount. I ran an XLR cable from the mic to my mixer, engaged the phantom power on that channel, and was ready to roll the proverbial tape. After setting the input level, I cycled through the pickup patterns to get a sense of the tonal range. The major pattern settings performed as expected, with the off-axis rejection increasing as you go from Wide- to Hypercardioid. Omnidirectional mode sounded very uniform at any angle. The Cardioid pattern was a favorite, with that classic C 414-esque richness from the proximity effect and the snappy character up in the high mids. My first test was to simulate a voiceover session. I have a fairly deep voice, and the 80Hz roll-off in Cardioid mode produced a great tone without sacrificing too much bass. No pad was needed. The C 414 is very versatile, but it's not usually my first choice when tracking acoustic guitars. But for demo purposes, I decided to give the XLS version a fair shake. Again in Cardioid mode with no roll-off or pad, I was able to get a fantastic sound from a fairly bright Martin dreadnought. The sweet spot seemed to be down closer to the bridge than I normally go, just under a foot away from the body. I had a few sessions scheduled for vocal tracks, and it was a good opportunity to put the C 414 XLS through its paces as a vocal mic. First up was a female singer-songwriter. She has a higher voice that can get a bit shrill when she pushes, and to my ears this mic wasn't the best match. Later that day I was able to try it out on a male vocalist singing some contemporary R&B, and the results here were much more pleasing. I wouldn't go so far as to say this mic is better on male vocals than female vocals, though. I think it's more a matter of tonal character. I'd bet the C 414 XLS would sound really nice in front of a chanteuse singing smoky torch songs. Finally, I set the C 414 XLS up to capture some percussion sounds I needed to add texture to a project I was working on. As I expected, the crisp character was a great fit for shaker, guiro, and claves, adding enough body to keep the tracks from getting overwhelmed in the mix. I didn't try it, but the high SPL handling on this mic would probably pair well with a snappy snare drum. Overall: Great microphone!!. I used this to record vocals for my album. In the manual, its recommended to use for back up vocals, however I used it for lead vocals. I just used the recommended settings. Anyway, Its little more linear than 414 XLII version. I was looking for a good mic that was very linear and works great with pre amp/compressors. The AKG 414 XLS is one of the few mics on the market that is close to a linear frequency response for a reasonable price. Comes with a case, pop filter and shock mount. No external power needed as well. Its high quality and works excellent for booth recording. The main characteristic of this mic is that it has a sensitive proximity effect. A vocalist or engineer might have to do a couple of takes to become one with the mic, especially perfectionist. A vocalist or lyricist would have to know how to control there vocals, wind and pronunciations. Once you get the hang of it, its very controllable and cool to use. I would recommend using a compressor and EQ console with this mic before you send it into your DAW. Comes out smooth and rich. Isolates very well in studio booths. So glad zZounds offers payment options with free overnight shipping. Can't beat that!! close [x]USED, BlemishedThis is typically a customer return with minor cosmetic imperfections, such as superficial scratches or scuffs on the finish. This inventory includes all parts, components, manuals (hard copy or downloadable) and the full factory warranty*. It has been tested to manufacturer's specifications and is guaranteed to work perfectly. It may be less attractive than Warehouse Resealed inventory, but it's priced even lower! This inventory is a great value.